Using a credit card sensibly can be just like taking out a loan. Many credit cards can beat loans when it comes to interest rates but there can be some pitfalls when using a credit card as an alternative to a loan. There are a few ways where using a credit card can be less expensive than taking out a loan. Although many people do consider credit cards as an expensive option when it comes to spending it all depends on the interest rates. Consumers who do not mind switching credit card accounts and transferring balances to banks can come out on top with credit card spending. But there are pitfalls when using credit cards as an alternative to a loan. Getting repayment dates wrong can see increased interest payments applied to the credit card accounts. There are credit cards that allow transfers of a lump sum of cash straight into a bank account. But this will only be a good financial option if the lender provides this service at a low interest rate. A few credit cards do permit lump sum transfers but customers will pay high interest rates. It will mean that credit card customers now owe the cash transfer amount on their credit card and will pay interest on it. This sort of lump sum transfer can be a money losing option if the interest rates are high. 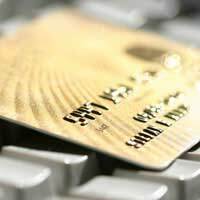 Customers with debts on multiple credit cards are paying multiple interest fees as well. Many customers take out one bank loan to clear all of their credit card debts and eliminate the multiple monthly interest payments. But transferring all debts to a credit card with zero interest for a long period of time can beat the bank loan interest rates. The downside is that many people begin spending on the new credit card and are charged at a higher rate of interest. The new spending amount cannot be repaid until the previous cheap rate debt has been repaid. Transferring all debts onto a zero or very low interest rate credit card can be a good idea. But most of the zero percent rates are introductory offers with a certain time limit until the interest rates kicks in. Customers should look for credit cards that come with long zero percent introductory periods in order to pay off their present debt. Not paying the transferred debt will mean that customers are charged interest when the introductory offer expires. There are special introductory zero percent credit card transfers that can last for 16 months. Many credit cards allow their customer to withdraw cash amounts but this will usually come with much higher interest charges. Withdrawing lump sums of cash using a credit card is never recommended and is never a good alternative to a loan. Most credit cards come with interest free periods for purchases, and if the debt is paid back within this period no interest applies. This is not usually the case with cash withdrawals. Interest will apply to cash withdrawals the moment money is withdrawn from the cash machine. Every transaction made using a credit card is just the same as taking a loan, no matter how small or large the transaction is. The interest rate is the key figure when using a credit card just as it is when applying to a bank for a loan. It is almost impossible for customers with bad credit records to receive credit cards with reasonable rates of interest. It is a wiser option to simply avoid credit card spending and loans altogether if the applied interest rates are high. Lending options such as credit unions are a far better borrowing alternative to high interest credit cards. Shrewd credit card borrowers can use low and zero percent interest rates and balance transfers to their advantage. But not keeping a close enough eye on these accounts could lead to financial losses. Lenders are becoming very strict with what is known as credit card juggling. But for those with good credit records, credit cards can be an excellent alternative to traditional bank loans.